Here at Jenco we talk a lot about being a learning organization and about all the opportunities that come with learning. This month we shine the employee spotlight on a favorite Superintendent who has earned his way up the corporate ladder. Ben Dallmann has been contributing to the Jenco business for over 14 years and he is an excellent example of what willingness, drive, learning and delivering with excellence can do for you here. 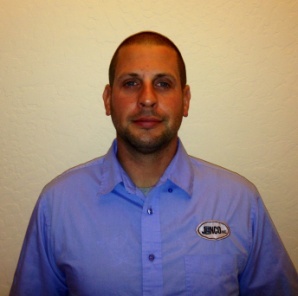 Ben is currently a Superintendent but started out with Jenco learning his craft in the ABA Apprentice program in 2000. When you ask anyone about Ben you will hear he is a great person to work with, but don’t let his easy going style fool you. He has a laser focus on safety and is absolutely committed to deliver profitably and with high client satisfaction. He has quite a strong reputation with both his internal and external clients and is currently overseeing our important Tucson K-12 education projects. Two of his major accomplishments while with Jenco were overseeing the architecturally stunning Gateway IEB project with Core Construction and four Banner Medical Office Centers with Kitchell. It goes to show that hard work, willingness and dedication do pay off. Ben is always learning about the industry, making offers to take on more responsibility and working hand in hand with our clients to ensure satisfaction. Thank you Ben Dallmann for your dedication. Way to go for being this month’s employee spotlight.